Michael Short Farmers' markets are largely viewed as helping local communities, but at the Grand Lake market, the bulk of the vendors are not from Oakland. Madeleine Bair Spring Opara couldn't get into the Grand Lake market, so she set up shop across the street. 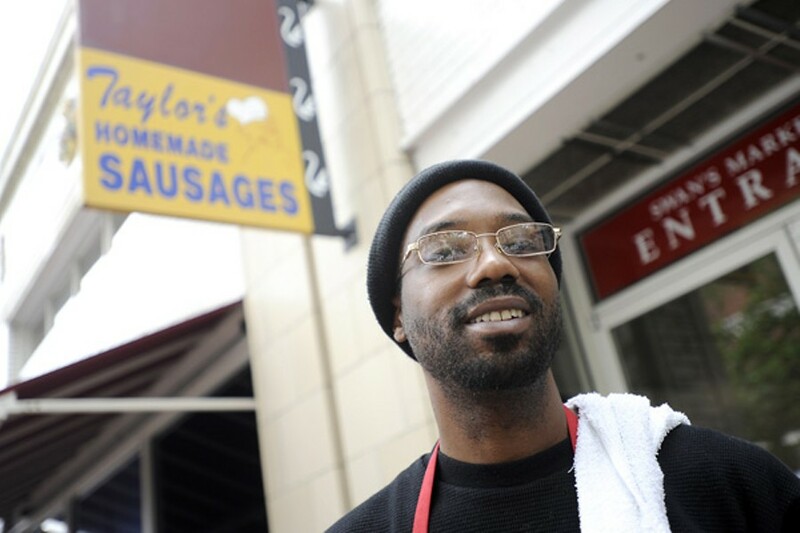 Michael Short Harold Taylor of Taylor's Sausage says business takes a dive during the Old Oakland market. 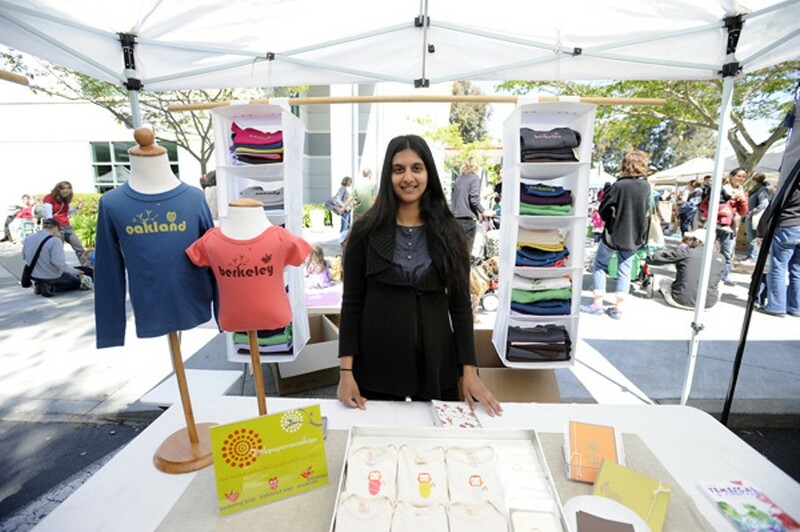 Michael Short Aparna Rao gave up on the Grand Lake farmers' market after applying three times. Now she sells at Temescal. Spring Opara doesn't just shop at the farmers' market in her Grand Lake neighborhood. She does the farmers' market. Reusable shopping bag dangling from her arm and her stomach primed for a filling of fruit samples, the Air Force veteran marches down her hill across the street every Saturday, prepared for a long, lazy morning, taking it all in. Salmon jerky. Macaroons. Hundreds of Oaklanders, including the neighborhood friends she's bound to run into. "I partake of just about everything here," said the fifty-year-old with bouncy, graying dreadlocks, as she sat perched atop a concrete slab next to the Afghan bread stand. "I love the products, I love the diversity," she gushed. There's just one thing that bothers the artist and businesswoman: "If you walk around and see where some of these folks are from, very few are Oakland residents." She's not talking about the farmers; few people expect them to be from the city. Instead, she's talking about the dozens of vendors at the Grand Lake Farmers' Market who have nothing to do with farms. It's the artisans, masseuses, hot-food sellers, and the like who have grown to comprise the bulk of the nearly one hundred vendors at the market. And most of them aren't from Oakland. At least not in the official famers' market, that is. "You see there's a group over there on the corner by the T-Mobile," Opara said, pointing across the street to three tables huddled under the sliver of shade offered by palm trees on a traffic island. "Those are local residents — Oakland residents." More small vendors carve out ad hoc retail space along the outskirts of the market — under the Kwik Way sign and in the shadow of Lakeshore Avenue awnings. They half-jokingly call it the "farmers' market ghetto," or the "stepchild" of the real thing. Opara has been there herself, in front of the T-mobile store using the bait of homemade cookies to slow down foot traffic and draw attention to her line of hand-cut queer greeting cards. "We got a decent reception," she said. "But I think people were still, like, 'Oh, you guys are cool, but you're not part of the market.'" To make it into the official market, Opara first needs approval from the Marin nonprofit that operates it. If accepted, she still has to wait for a spot to open at Grand Lake, the most popular of the markets run by the Agricultural Institute of Marin, and would then have to pay the organization an annual fee. The result of this arduous and competitive process is that many local artists are shut out of what they see as the ideal way to cultivate their nascent businesses. To Opara, something is wrong with this picture. "If the city isn't coordinating this," she said "how do we get into a market in our own area?" 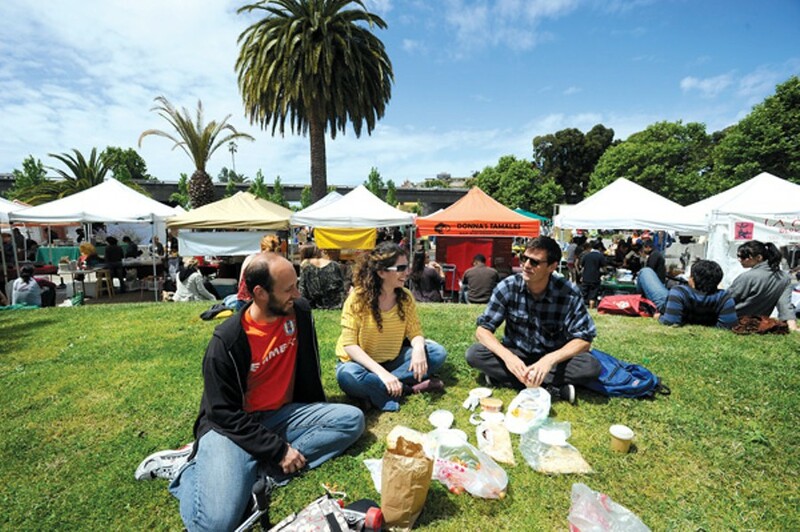 It's one of many questions Oakland's entrepreneurs are asking of the weekly open-air markets. Concerns about vendor policies, doubts about purported benefits to neighborhoods, and debate over city priorities are starting to cast a shadow over the markets. Despite their overwhelming popularity, and partly because of it, Oakland's farmers' markets have drawn tension, ire, and a litany of complaints from struggling small businesses that feel excluded from all the good-feel commerce. The nascent debate stems from a decision by many farmers' markets, including the Grand Lake, to diversify beyond simply providing a place for local farmers to sell produce and vegetables directly to urban dwellers. In cities such as Berkeley, where farmers' markets have remained true to their original intent and strictly limit the number of non-farm vendors, there has been little to no controversy. But in Oakland, where the markets receive free space from the city and are now dominated by non-local vendors that crowd out Oakland businesses, compete with brick-and-mortar stores, and often fail to pay taxes, it's a different story. In the introduction to her cookbook, Chez Panisse Vegetables, Alice Waters wrote of her difficulty procuring fresh produce when she opened her landmark restaurant in 1971. "Back when we began our search," she wrote, "our choices were limited. There were no farmer's markets in Berkeley, no produce brokers specializing in organically grown vegetables, no commercial vendors of wild mushrooms." Forty years later, you can find farm stands on a city street just about every day of the week, with crowds — and often, prices — that rival Berkeley Bowl on a weekend morning. Oakland residents got their first taste of farmers' markets — a tradition revived from the World War II era by churches, hunger alliances, and the California Department of Food and Agriculture — 22 years ago. When the Old Oakland and Jack London Square markets launched, they were at the cusp of a nationwide movement to resist corporate agribusiness. Behind the local beets and green beans was the motivation to return to the soil, to the seasons, and to support struggling small farmers. 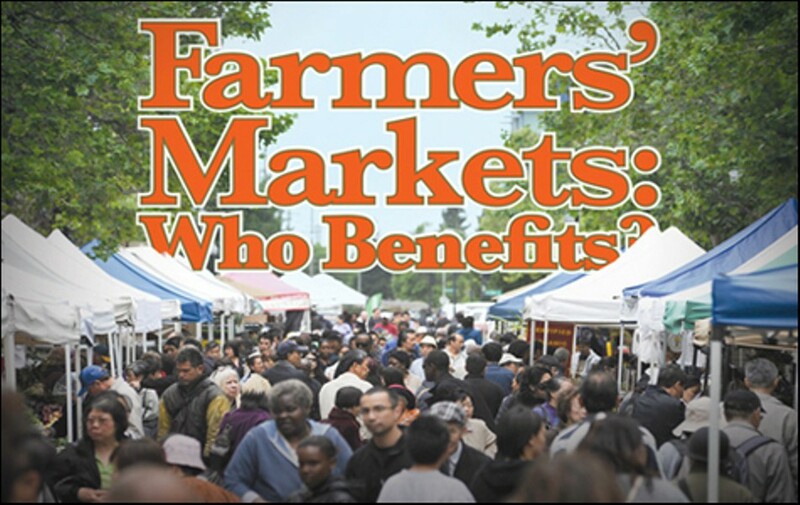 In the two decades since, the popularity of farmers' markets has skyrocketed. Across the country, their numbers climbed from fewer than 2,000 in the early-1990s to more than 6,000 last year. In Oakland, the explosion began in earnest in 2005, when neighborhood business districts brought markets to Montclair and Fruitvale, and the following year to Temescal and Grand Lake. 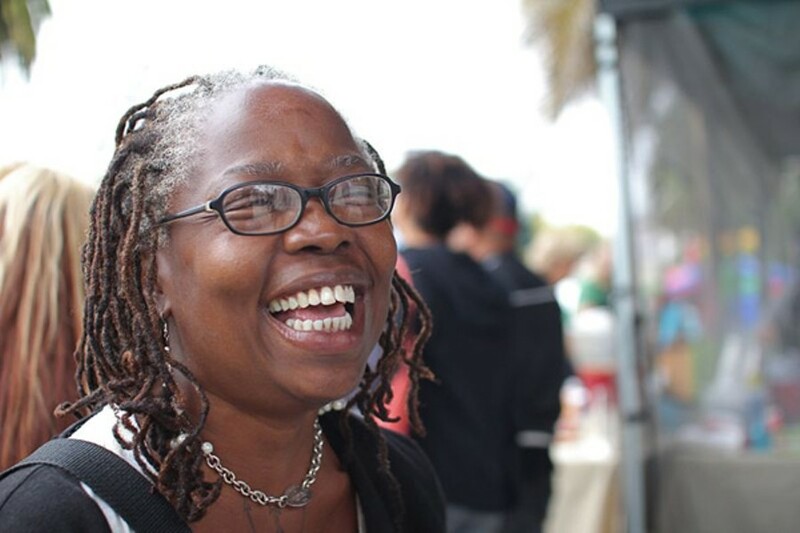 Others have come and gone throughout the years: A produce stand in West Oakland; markets sponsored by churches in East Oakland; a community food network in the Laurel district; and, more recently, markets at clinics and hospitals throughout the city.